As a professional Chinese manufacturer of OEM parts, we strive to provide high quality products to our customers. So we use CAD, CAE, CAM technology and high quality production equipment and inspection equipment in the production. Our advanced machines include static pressure moulding line from German KW Company, automatic moulding line from Swiss GF Company, direct reading spectrometer, three-coordinate measuring machine, X-radiographic inspection machine, etc. With these advanced machines, we can produce 100,000 tons of iron castings every year. The weight of grey iron castings and nodular iron castings ranges from 2KG to 400KG. Today, our OEM parts, such as cylinder block, cylinder head, manifold, and crankshaft, are popular with our customers in many countries. They are widely used in tractor, heavy duty truck, bus, diesel engine, engineering vehicle and more. Relying on our special machine tool production base, casting production center and CNC machine center, we can produce high quality cylinder block and other OEM parts for our customers. 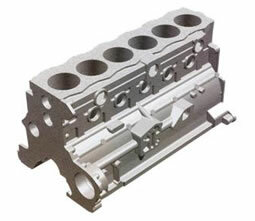 Our cylinder block sells well in Europe, America, Japan, and many other countries. In addition, we also offer OEM parts of agricultural machinery, construction machinery, mining dump truck, pickup truck, trailer, and so on. Our products are all manufactured in accordance with ISO9001:2008 and ISO14001 international standards, so you can feel at ease in purchasing and using them. Please feel free to contact us if you are in need of OEM parts or our other products. We believe that you will be satisfied with our products and services. Concrete Mixing PlantOur concrete mixing plant uses modularized design. It is easy to install and transfer.